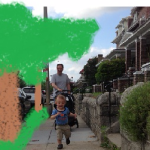 Have an idea for our streets and sidewalks? 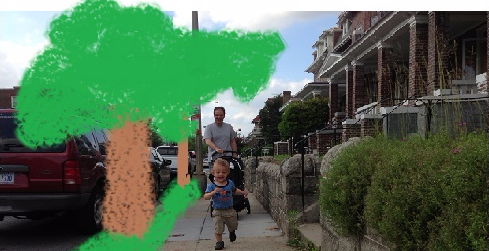 Park View is a wonderful neighborhood, but as many have pointed out, many of our streets need more tree boxes, wider sidewalks, and safety features like speed bumps and better signs. The Park View United Neighborhood Coalition (UNC) is engaged in an effort to bring improvements to our streets and sidewalks. There is currently no formal city plan to improve Park View’s “streetscape.” Come out to the UNC meeting this Wednesday for a conversation with city planning officials to see how we can get more attention focused on our neighborhood streets! Also: does your street need repairs or minor improvements? The Mayor’s Constituent Services Office will be at the meeting Wednesday to hear your complaints and connect you with the right agency to solve your problem! 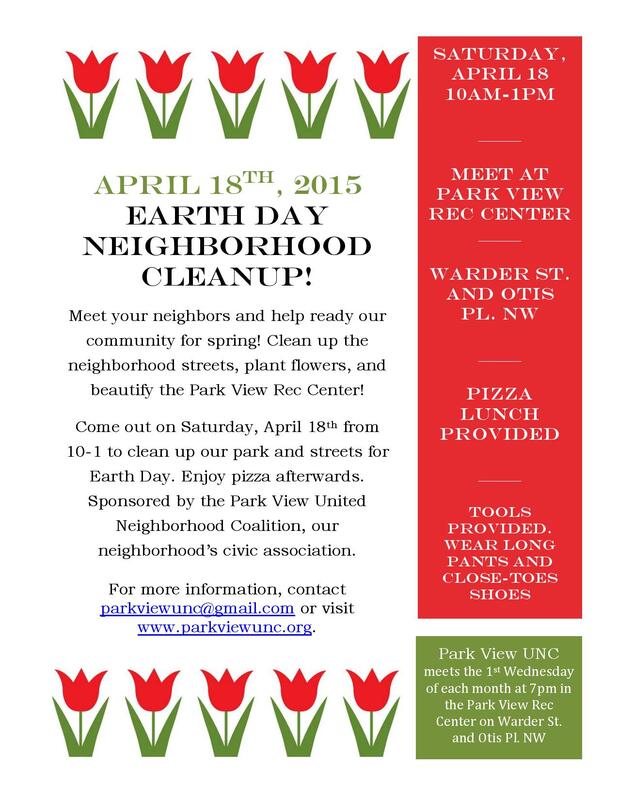 The UNC is planning a big cleanup for the neighborhood on April 18th! We need your help to make this event a success. We would like to raise $150 to pay for flowers and food for the volunteers. 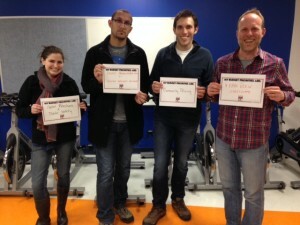 Click the donate button below to chip in! Last month, the Park View UNC submitted comments to Mayor Muriel Bowser asking her to prioritize the Park Morton redevelopment, modernization of the Park View School building, additional funding for schools serving high populations of low-income and other “at-risk” students, funding for the Bernice Fonteneau Senior Wellness Center, and streetscape planning in Park View. Read our full comments here. The Park Morton Discussion in March has been postponed after the snow pushed back various important schedules for the speakers. The UNC will still meet in March at our usual time and place (Wednesday, March 4, 7-8pm in the Park View Rec Center). Info on a new speaker will be posted soon! Neighbors please “Save the Date” for next month’s UNC meeting. 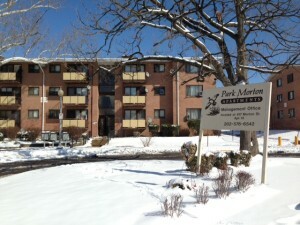 We are discussing a very important topic I know is of great interest to the community: the redevelopment of Park Morton. Representatives from the Mayor’s New Communities Initiative, DC Housing, Ward One Councilmember Brianne Nadeau’s office, and the Park Morton Tenants Association will be there to discuss the future of this project with the Park View community. Please come to get info and find out how the community can support this important project! Attention parents and anyone interested in our schools: the Park View UNC meeting this month will focus on education and the common lottery. 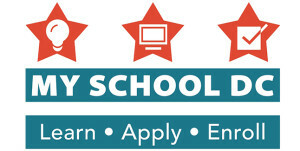 This is the second year of the DC common school lottery, which now includes all schools that are part of the District of Columbia Public Schools (DCPS) system and most public charter schools. 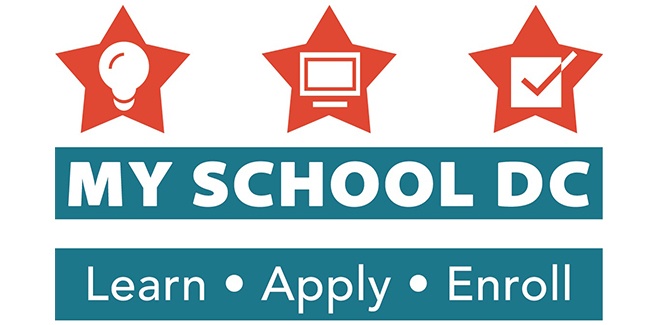 Parents enter the lottery if they wish to enroll in the early childhood programs for children aged 3 and 4, or if they wish to send their children outside their local in-bounds DCPS school for grades K-12. A parent who went through the lottery process last spring will be there to share his experiences, and a representative from Bruce-Monroe Elementary at Park View, Park View’s neighborhood elementary, will also attend to offer parents information about Park View’s in-boundary elementary option. The UNC hosts public community meetings the first Wednesday of every month. Meetings are free and open to the public, new interest always welcomed! There were some questions recently on one of the neighborhood listservs regarding how and when to use the MPD text-message tipline, 50-411. We had the pleasure of hearing from Commander Wil Manlapaz and Lieutenant David Augustine at this week’s meeting of the Park View United Neighborhood Coalition. One of the things we learned from the officers is that the tipline is not meant to be used for reporting crimes in progress. Instead, it is meant for tips that might be used to solve serious unsolved crimes (for example if you know who might have caused a homicide, robbery, etc). If you observe a crime in progress (for example, drug sales in progress, someone in possession of a concealed weapon, or someone making noisy threats), you should call 911, no matter how small the crime. This way, a dispatcher can ask you the questions police need in order to stop a suspect without violating his or her constitutional rights. Make sure to offer your phone number for a call back (the courts have said that the police cannot make a stop or search a suspect based solely on an anonymous tip). Thank you to everyone who attended the UNC meeting on Wednesday and for your interest in neighborhood safety! The January UNC Meeting is tonight! There has been a recent increase in shootings in the area, including several homicides. While most of the crime has occurred outside the immediate UNC boundaries, the UNC has invited a speaker from the MPD to discuss the recent shootings and other criminal activity that may be of interest to neighbors. Officer Lieutenant Augustine, who is stationed in Police Service Area 409, has accepted the invitation and will attend the January UNC meeting. For the past two years, the yellow monthly newsletter of the Park View United Neighborhood Coalition, your local civic association, has been delivered as an insert in the white monthly Advisory Neighborhood Commission newsletter. Moving forward, the two newsletters will be split. The white ANC newsletter will still be delivered each month, but the yellow UNC newsletter will no longer be included. The reason for the split is to avoid confusion between the two newsletters. We thank ANC Commissioner Kent Boese for his support of our neighborhood civic association over the past two years, and for all the work he does to keep Park View residents informed. Want keep getting the Yellow UNC Newsletter? Join the UNC or renew your membership! All current members of the UNC will receive the newsletter either by email or hand-delivered to their door. Membership is free. Join online here, or sign up at a monthly meeting. 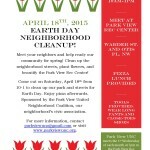 Come to Our Neighborhood Meetings! We meet the first Wednesday of every month, 7-8pm in the Park View Rec Center. All meetings are free and open to the public. You are invited to join us at the Park View Recreation Center this next Wednesday for a neighborhood holiday potluck. If you have never been to a UNC meeting, this is a great time to come out and meet your neighbors at this fun holiday event! We are still looking for volunteers to help with setup and cleanup! Setup starts at 6:30pm. is our neighborhood’s civic association. favorite holiday dish to share. donation to Toys for Tots.